Hi, we’re Atwood Forest Products. Atwood Forest Products, Inc. is a large hardwood sawmill centrally located in Michigan. Ron Atwood, dba Atwood Forest Products, worked in the woods, cutting, skidding and hauling logs for other sawmills. Dan Atwood joined Atwood Forest Products in 1985 followed by Todd Atwood in 1986. In 2005 Atwood Forest Products experienced devastating fire. It destroyed our largest, newest building where we graded all the lumber produced in our sawmill as well as all the lumber we shipped in from the many other sawmills. We were then faced with the decision of what to do next. We took the leap and built a 45,000 square foot building to house a brand new mill. A debarker feeding a double cut McDonough band headsaw with an optimizing log scanner which feeds the McDonough linebar, with edger, double end trimmer behind the grader and 165 feet of green chain for sorting lumber, producing 20,000 to 25,000 board feet of furniture grade lumber per day. We were now set up with a brand new sawmill when the economy, specifically the housing industry, took a bad turn. Being so tied to the housing market as producers of graded lumber used for furniture, flooring and construction, we had to make some drastic changes to survive this economic crisis. So we quickly revamped the brand new mill to handle cutting timbers for railroad ties and crane mat timbers. Our focus changed from furniture grade lumber to apple box material, railroad ties, and crane mat timbers. Graded lumber became the least of our production. The old sawmill was supposed to be retired but rather became an important component to our current crane mat production. 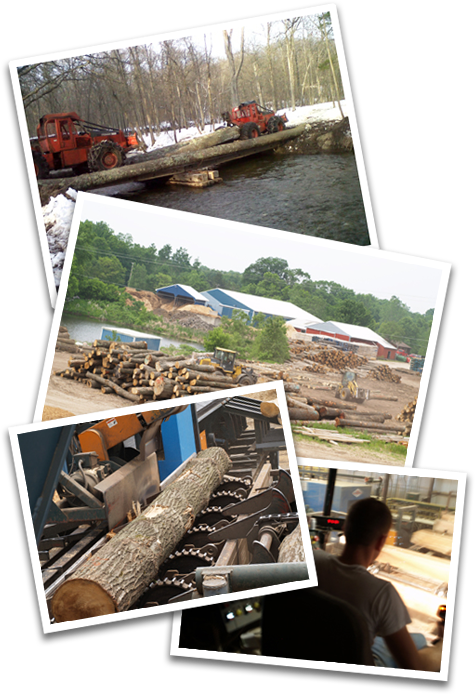 As of 2011 we operate two sawmills in Cedar Springs, MI with our focus diversified from the housing industry to servicing the companies who maintain and build the infrastructures across the country. Cranes and heavy equipment used to install and/or repair utility lines and pipelines or clean up environmental spills from faulty pipelines must navigate over wetlands where roads do not exist, thus the crane mat. A road is constructed by laying crane mats side by side and sometimes in multiple layers for the equipment to maneuver over creating a roadway to otherwise inaccessible lands. Only because of our ability to change with the markets have we survived in a struggling economy. Our sawmill sets on 27 acres and employs just under 50 employees with at least 50 subcontractors. Dan runs the sawmill, sells the lumber and manages the employees on site while Todd handles the timber buyers, woods crews cutting, skidding and truck drivers hauling logs into the mill as well as selling veneer logs. Ron is a die-hard, he is still repairing equipment and keeping an eye on maintenance. Atwood Forest Products prides themselves on select cutting timber as to protect the residual wood lot. The wood lot will regenerate itself and could be cut again in ten to fifteen years. A natural regeneration will take place if the woods is cut correctly. To keep up with demand, we also buy timber from other loggers across the United States.